“I do enjoy the quiet the older I get; the more quiet time I have, the better. It makes other rambunctious periods a little more meaningful. And vice-versa.” — Justin Vernon. The soulful impacts of the rugged scenery found along the Wild Atlantic Way and moments of wonder found in Ireland creates an emotional connection and lingering impression unlike anywhere else. The mood is winter-cosy, the daylight hours are short, the locals are exceptionally charming, the stories of the land and its people are mysterious and engaging, the roads are winding and lined with dry stone walls precariously placed on top of one another and the scenery… well, the scenery is what everyone goes to Ireland for — that, and the Irish pubs, of course. The weather is wild, rugged, unpredictable and at times, there are moments when you may feel dampened by the ever-present winter-grey, but just as quickly as these thoughts occupy your mind the sun will burst through and for a brief moment everything is refreshed, illuminated gold around you. Serving as a reminder that there is beauty all around, in every given moment – especially in the clouds. To set the scene: it was Wednesday night in Australia and I contacted my dear friend and fellow traveler Camilla (who lives in London) to ask her what she was doing on Friday that very week. Camilla and I spent two weeks trekking in remote areas of Nepal together back in 2016, in 2017 we met and travelled for three weeks through the North and South of India and here I was in the final month of 2018 asking her to join me (extremely last minute) in Ireland. Camilla walked straight into her Boss’ office to organise the Friday afternoon off and booked a flight from London to join the adventure. I was already extremely excited having wanted to visit Ireland for a very long time, but now I was elated to be hitting the road with one of my favourite travel buddies by my side. From Australia, it takes close to 30 hours of travelling to reach Dublin. The exciting part? You can now fly directly there! Arriving in Ireland in the late afternoon, I picked up my hire car and begun the first leg of my journey, observing the sunset, across the rolling green hills, as it flashed past my window on the 2 and 1/2 hour drive west towards Galway. Arriving in Galway right in time for a delicious dinner and warm welcome to Ireland, plus greeting Camilla. Although my internal body clock was in complete disarray, I was running on the adrenaline that is inextricably tied to the excitement of being somewhere unfamiliar. Camilla turned to me and said “I’m sorry Melissa, I don’t care how jet-lagged you are, you can’t come to Galway and not visit an Irish Pub” – so off we went. We strolled through the streets, wide-eyed at the sight of all of the Christmas decorations and decided to ride the merry-go-round in Eyre Square, giggling along with all the other children. An expectedly busy Friday night, we found a pub with live music and enjoyed a cider whilst experiencing my first Irish pub live performance. On the way back to the hotel we detoured again, removed those winter layers in the coziness of an intimate pub, where the walls were lined with black and white photos from the past, and found ourselves shoulder to shoulder with the locals immersed in the culture; it was hard to walk away from the serenade of a traditional Irish Band. Continuing along the Wild Atlantic Way to Clifden, County Galway. The Wild Atlantic Way is Europe’s last Atlantic frontier with dramatic sea and landscapes, defined by a route that stretches 2,500 kilometres from the north of County Donegal to Kinsale in the south at County Cork, hugging the western seaboard coastline. 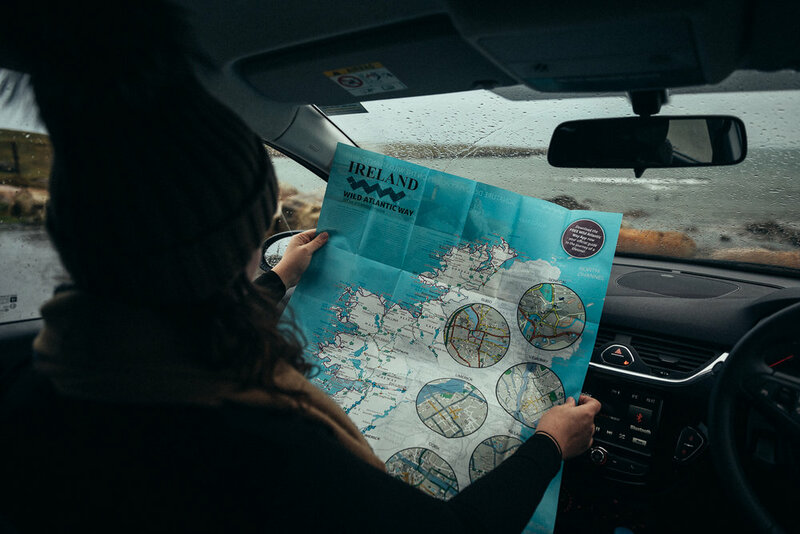 Upon receiving my itinerary I realised that I wanted to do a “quick” detour to the iconic Cliffs of Moher, even though we were due to head north-west from Galway along the Wild Atlantic Way. Leaving in a cloak of darkness, Camilla and I planned to arrive at sunrise. 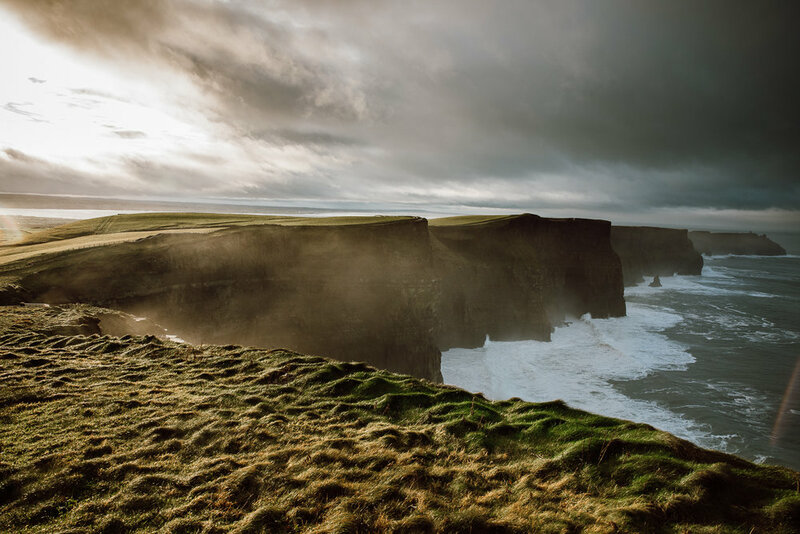 The Cliffs of Moher are quite a popular tourist destination, attracting approximately 1 million visitors a year, and have been featured in two very famous films. Upon arrival, however, it is not hard to discern that it is the striking natural beauty alone that is the major draw card. Rising 214m out of the Atlantic Ocean, the Cliffs of Moher are a site to behold, and on sunrise we had the whole place, to ourselves. For the first few hours of the morning we walked along the cliff path, admiring Nature’s wonder surrounding us. The cliffs themselves have been carved by time (350 million years), the mighty Atlantic Ocean and Ireland’s wild weather into incredibly interesting shapes and formations; the beauty found here is incomparable. After a few hours, we decided to retrace our steps and to get back on the path – after all we had a Castle to sleep in that night and I was excited to see more of this breath-taking coastline. On the journey to Clifden, I fell in love a hundred times over. The rolling green hills, the stone lined highways, the quaintest of homes, sheep everywhere, the way the light kept dancing with the dark clouds – I felt like I was in a dream. We stopped off at chocolate heaven (aka Hazel Mountain) for an early morning coffee and chocolate — it is okay to eat chocolate for breakfast when technically your body clock is on evening time, right? We continued on through the Dunguaire Castle, who’s 16th century tower house sits on a rocky outcrop on the shores of Galway Bay and up through towards Ballyconneely for lunch. The weather turned in and we decided to take it slow, exploring the striking coastline which takes your breath away at each winding turn. After beautiful, long day taking in the sights we arrived at the famous Abbeyglen Castle Hotel and checked in for a luxurious night of comfort and splendour- just as the hotel was built for back in 1832. Depart Clifden and head north (eventually) to Westport. If I could have chosen to spend more time in Connemara National Park, I would have explored it all; however, I had to decide on just 1 day-hike, so again we rose before the sun, leaving our luxurious castle behind, and headed in the direction of Tully Mountain for sunrise. The winding roads were quiet at this hour, the morning was moody as if they skies might open up at any moment. Camilla and I set out towards finding the path and the peak of Tully Mountain for a 360 degree vista of the risen land diving into the Irish sea. A brief and fleeting break in the clouds threw gold everywhere, illuminating the space before us as backlit raindrops filled the sky and my heart swelled; I remember feeling like I was in the right place at the right time that morning. Passing through Letterfrack around lunchtime we made our way to see Kylemore Abbey from the outside; an impressive neo-gothic structure built in the heart of the Twelve Pins mountains. Taking the inland route of Doo Lough Valley through some of the most stunning countryside I have encountered. I think Camilla and I spent majority of the afternoon pulling the car over and climbing the hills, to view the lochs from above and to attempt to capture a photo of the Irish sheep before they scattered away across the land. It’s quite surreal spending time along the west coast in winter, it feels like a wonderland – a giant playground of sorts and as if time slows to still. By the time the afternoon closed in we had found ourselves checking into the next hotel and enjoying a cider at the local pub in Wetsport, County Mayo. N.B* On this journey is the Croagh Patrick mountain which provides for a pilgrimage hike to the mountain peak at 762 metres (approximately 5 hours up& down). Unfortunately, due to time constraints, we didn’t complete this hike; however, I heard about it from almost every local we came across. And, for a fun fact: Reek Sunday, the last Sunday in July is the day in which hundreds of people, some in barefoot, take the climb up the ‘holy mountain’ in honour of St. Patrick, who spent 40 days fasting on the mountain in 441AD. 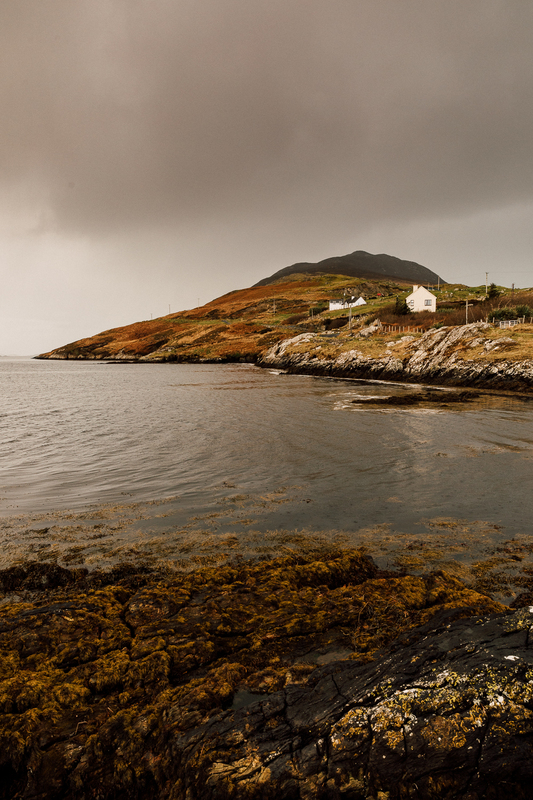 Put your exploring shoes on and head for Achill Island. Achill Island is an island of isolation, accessible via road bridge, the stunning cliff scenery and ever-so-perfectly winding roads dropping off into even more beautiful beaches. I was speechless with every new turn. Originally, I had planned to hike up past Keem Bay, towards Croaghaun Mountain for a vista plucked from my dreams, however, upon arrival, I quickly realised that Mother Nature had something else in store for me. I’m getting more and more okay with the “I’ll be seeing you” conversations, as it is one I have many times a year with friends spread all over the world and due to living life on the road the way I do. Earlier that morning, before dawn, I said the familiar sentence as Camilla departed on her bus journey to the airport and straight back to work in London. A few hours later I found myself alone, in Keem Bay, walking up the slope of a hill and watching as the grass before my feet moved rapidly in the wind, the waves as they crashed into the white and black marbled sand of the horseshoe bay below, all-the-while wondering how many times someone had sat here like me admiring such a stunning view. Croaghaun mountain was in a cloud that day, which gave me the time to hike as far as I could and become still to admire; contemplative to how the water could sparkle even through the sky was grey and imagine how those little buildings that dotted the land below came to be. From here found my way to Ballycroy National Park to enjoy the afternoon by the Claggan Mountain costal walk, which is the only coastal site which offers a walkway across the bog with panoramic views of the National Park mountains, facing south towards Claggan Mountain and across to Achill Island. Head towards Knocknarea, South County Sligo. Day 5 along the Wild Atlantic Way found me standing at the edge of the earth for sunrise along the Erris Head Loop Walk. Be sure to bring proper hiking shoes, because it gets muddy and also bring your sense of adventure! I imagine it would be somewhat different in the warmer months, as this walk should not be missed, but that morning it was just myself and the sheep. Although I was rained on, twice – and I am talking more than just a pitter-patter – nothing could wipe the smile off my face the moment the sun shone through and brightened everything around me. 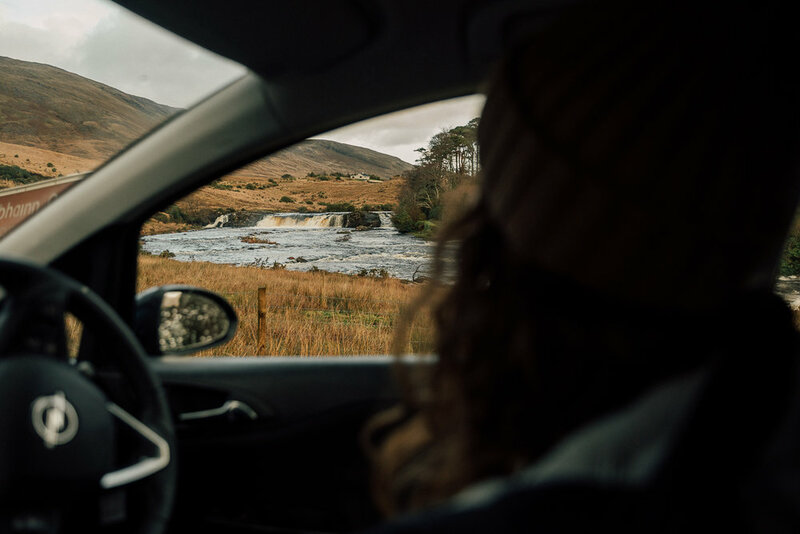 The further I drove, the more I began to realise that I was head over heels for this Irish Countryside and its raw, rugged cliffs; scenery that brought me to tears. By afternoon I had arrived at Downpatrick head and stood appreciating this windswept costal beauty and the layers of multi-coloured rock strata sitting out in the wild Atlantic Ocean. Downpatrick Head is a place of historical importance. 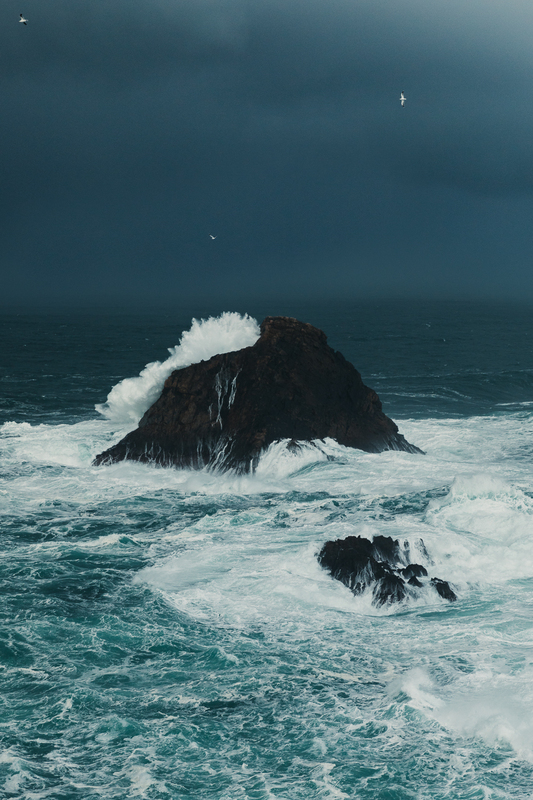 A lone sea-stack called Dún Briste (broken fort) and local legend has it that when a pagan chieftain refused to convert to Christianity, St Patrick struck the ground with his crozier, splitting a chunk of the headland off into the ocean, with the chieftain on top! Sligo to Dublin – A goodbye. I feel I left a piece of heart behind in Ireland; I knew it strongly the day I was leaving. Although I had to make my way from Sligo to Dublin international airport to begin a 30 hour commute home in time for Christmas, I couldn’t resist the early morning I drove out to the Classiebawn Castle on my last morning to take in the beauty of the panoramic view and spend an unforgettable last morning perched on the side of the hill along The Wild Atlantic Way. And so, it is - the irresistible charm of Ireland and the Irish. The beauty of this island is all consuming and breath-taking, as are the people’s cheeriness, laid-back attitude and their ready acceptance of anyone (including one lone girl very far from home). I am convinced after six days touring The Wild Atlantic Way that there is nowhere else like the Irish countryside, that will fill your heart with wonder and leave a lingering impression. The memories created will remain dear to my heart, until next time. Because I know, without a doubt, there will be a next time. Thank you, Tourism Island, for having me, a whirlwind adventure and something I will never forget. Camilla, for being that friend – who will jump on a plane and hit the road for you. Regardless of time or distance in-between seeing one another, one of my favourite parts of your being is your insatiable urge to travel, discover and say ‘yes’ to opportunities. Love you.